On Saturday nights - particularly at this time of year - I keep returning to long-lost (but never forgotten) Eurovision favourites of mine. So in the absence of Retro Saturday, I thought it would be a good idea to start a new occasional series on my Eurovision memories. I'm starting with a trip back in time, 35 years ago, to the 1977 Eurovision Song Contest which took place here in the United Kingdom on 7th May, following Brotherhood of Man's historic win in 1976 with "Save Your Kisses for Me". Earlier that year I got my first cassette recorder and this was the first contest which I can remember taping the preview show when it was on the BBC (oh how we miss those days). It's a long long way from the contest we know and love today: a "rattle your jewellery" audience, one solo presenter (Angela Rippon), an intro-postcard of some national stereotyping, and no messing about - straight into the first song after 7 minutes. I still have fond memories of Ireland's entry that year: "It's Nice To Be In Love Again" by the Swarbriggs Plus 2. Yes of course it's ridiculously cheesy and old-fashioned, but who cares? Back in those days however there were still some countries singing in English, and two of them produced a couple of the best entries of that year, and indeed two enduring favourites of mine - both of them discotastic! Belgium's "A Million In One, Two, Three" sung by Dream Express and Germany's "Telegram" by Silver Convention - the latter were already known in this country thanks to their big hit "Get Up and Boogie". I'd have been happy with either of them winning - particularly "Telegram" which still stands up today as a great entry and one which I could still, in my fantasy world, imagine the credits rolling as the girls reprised their winning song. One major disappointment for me that year was the Swedish entry. After sitting it out in 1976 I'd expected them to come back with something worth waiting for - but "Beatles" by Forbes was, and remains, one of Sweden's weakest and poorest performing Eurovision entries. Of course in those days there was no Denmark (who rejoined in 1978) and Iceland (we had to wait till 1986)! What about the host nation? Unfortunately, and I know some of you might disagree, but "Rock Bottom" sung by Lynsey de Paul and Mike Moran remains one of my most-loathed home country representatives. "Promises Promises" by Rags - a three-person group which numbered a co-founder, manager and songwriter for later ESC winners Bucks Fizz - would have been a much better UK entry in 1977. Even in those days it was all about the draw position. France were drawn to sing in final position, 18th to be precise. 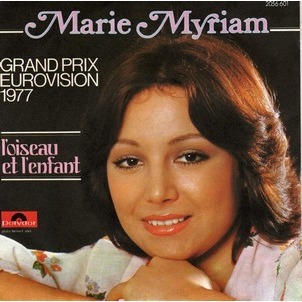 Marie Myriam, in a mustard-coloured dress, belted out "L'Oiseau et L'Enfant" which is a typical French-language 70s ESC entry, but even after all this time it remains a mystery to me why it won the contest that year. Best show of the month? No doubt about it - "THE HAIRY BIKERS BAKEATION" (BBC2, Tuesdays). Si "Kingy" King and Dave Myers are back on the road, heading across Europe to sample some of the best baking around. Now isn't that a dream job - combining two of my obsessions, food and travel? So far they've been to Norway and the Low Countries, next stop Germany - catch it on BBC iPlayer if you haven't already done so, it's an absolute treat. 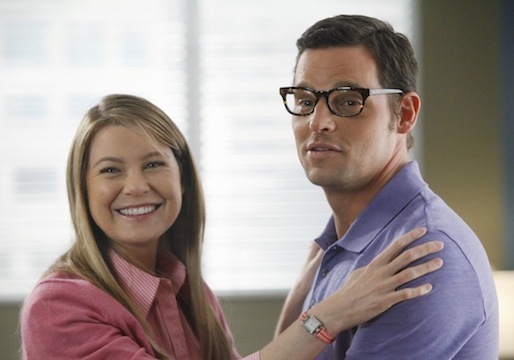 They're two of the most likeable people on TV, with a warm and funny sense of humour. Here at EuropeCrazy HQ, we love them! Biggest hype of the month? The (yawn) 'ratings battle' between the returning dancers-and-performing pets-fest that is "Britain's Got Talent", and the British version of that new global talent show phenomenon - "THE VOICE UK". 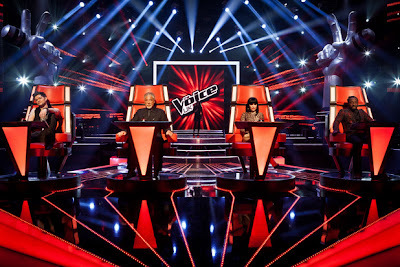 I wouldn't waste a second of my life watching anything with Cowell on it so needless to say...it's all about "The Voice", which finally started last night with the 'blind auditions'. The format is fresh and original, we know it well from seeing clips of various foreign versions, and you're guaranteed nothing but good singers. Even Jessie J and Will.i.am, neither of whom are particular faves of mine, came across as quite likeable, and Mum fancies Danny O'Donoghue (although I wasted no time in reminding her that Bressie is hotter). There's competitive namedropping between the coaches, but there's a warmth about the show which is lacking in certain other talent shows I won't mention. On the down side, do they really need to feature the back-stories, the sob-stories, the family members sobbing backstage - all staple fare of those other talent shows? And please, no more of this "this is all I've ever wanted" crap. Just get on with it and sing. On the whole though, we enjoyed week 1 and will be watching again. Perfect timing too, as we're both suffering from a post-Melodifestivalen Saturday night void. Poorest decision of the month: OK so who decided to drop "PARENTHOOD" (5*, Thursdays) from the 5* schedule? I tuned in last week and it wasn't there, replaced by The Mentalist. No sign of it this week either. What's going on 5*? We want answers. You can't do this to us. Social experiment of the month: Whether documentaries are 'dumbing down' or just becoming more 'populist' the TV channels are constantly looking for ways to adapt existing TV formats. 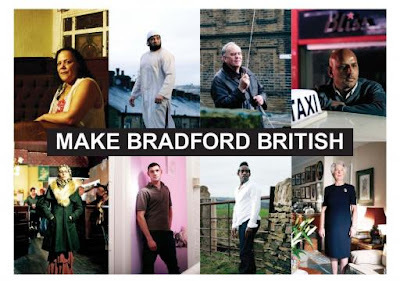 So, imagine Big Brother mixed with a non-gender-specific Wife Swap = "MAKE BRADFORD BRITISH" (Channel 4) in which a group of racially diverse British people who all failed the UK citizenship test were all put together to try to understand each other's cultures better. The result was more than predictable in an "I'm not going to do this/act like this anymore" way. At least at two episodes it didn't overstay its welcome. You wait for one documentary about racial extremism and two come along at once of the month: Regular readers will know that I'm no fan of BBC3 but occasionally I'll catch a documentary on there. This time it was "MY HOMETOWN FANATICS" where Stacey Dooley took a very personal look at two sides of extremism in her home town, Luton. As befits the BBC3 demographic it wasn't too heavy, and slightly simplistic at times, but young Ms Dooley has a down to earth appeal which may appeal to some of that demographic who would probably not watch something with a more serious, dry approach. Coincidentally, Channel 4 also screened a very similar documentary about the same theme and the same town, within about a week of the BBC3 show. 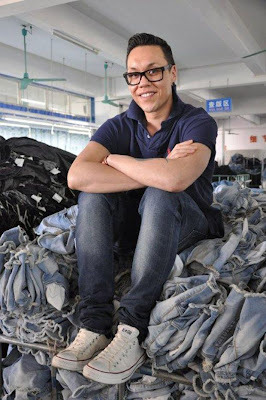 Celeb-fronted lightweight documentary of the month: I'm no fan of this type of show but don't really mind Gok Wan though, so quite enjoyed "MADE IN CHINA" in which the fashion guru went back to his father's roots and explored modern China. Gok came face to face with his Chinese doppelganger, and shops full of fakes including something called an "Eye Phone" which I thought was quite amusing. Like most of the other populist-docs of the moment it was pretty superficial and not too deep, but a nice way to pass an hour nonetheless. Glitterball of the month: BBC4 celebrated its 10th anniversary with a disco night! We've all seen the disco stories over and over again, but who cares when you get programmes like "THE JOY OF DISCO" which focused on the birth of the music phenomenon, and the underlying racism and anti-gay prejudice of the time. Scottish documentary series of the month: "HIGH SCHOOL" (BBC1, Mondays) is a very enjoyable short series about life at Holyrood Secondary School in Glasgow, which is Europe's biggest high school. When we learned that the show was made by the same production team which brought us the by now legendary shock-doc "The Scheme", we feared the worst. But don't worry - this one's all good, with not a Marvin in sight. Holyrood is a high-achieving school with a racially diverse group of pupils and very supportive teaching staff. Can we have another series please, BBC? 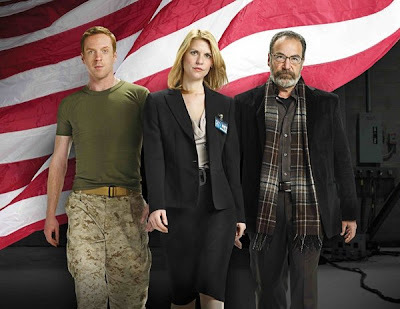 Big new US TV import of the month: I'm still watching "HOMELAND" (Channel 4, Sundays) although for some reason, it's as annoying as it is gripping. The is-he-or-isn't-he-a-terrorist main plotline is quite original, yet there is something about it which really, really annoys me. My friend at work who also watches the show answered my question - "it's her!" (leading lady Carrie, played by Claire Danes). I think there's going to be a massive plot twist. Or maybe I'm just trying to get excited about the show again, as it's gone a little off the boil over the past couple of weeks. 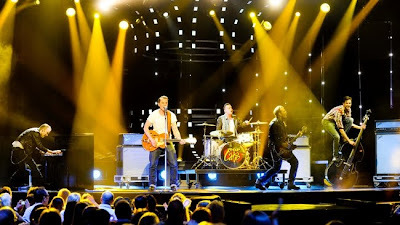 Here, finally, is my Melodifestivalen final review which I'm finally getting rounf to publishing after my blogging-break of the last couple of weeks! Anyway the computer was wired up to the TV (ah, the joys of an HDMI port!) in time for the final 2 hour extravaganza of this year's Melodifestivalen season, with yours truly and mum gathered in front of the TV at EuropeCrazy HQ for the final showdown. 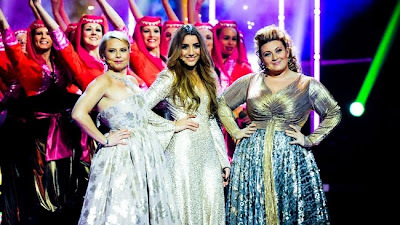 It kicked off with the hosts in a "Baku Baku" tribute to this year's ESC host city (to the tune of New York New York) followed by last year's MF winner Eric Saade dancing to a medley of his own songs, and only making the effort to mime when he could be bothered. The three hosts, Helena, Gina and Sarah sparkled in their party dresses (or in Gina's case, a catsuit). I'm really impressed with the job they've done over the past six weeks - great choice SVT! Mum was getting irritable by this point - "OK, enough of these presenters, when is this thing actually starting??" It did start eventually, and first on stage was David Lindgren to sing the Danny-reject "Shout It Out".Of all this year's performers, David is probably the one who will benefit from this high-profile career launchpad. This song has grown on me over recent weeks and it's an energetic opening number. Mum: "He looks like a bank clerk....although he's wearing trainers, so he's trying to be trendy". Laura: "Good vocals, good song and dance man - this will be a good springboard for him, but he's still lacking in charisma". Mum: "He's a very good singer though". Melodi nummer två: "Jag Reser Mig Igen" by Thorsten Flinck and his Revolutionsorkester. You know the score: another barefoot and intense performance of a (non) song which we've never managed to connect with at any time we've heard it during the contest. Laura: "Apparently you need to be Swedish to get him". Mum: "By the neck, preferably....he's like some drunk uncle at a wedding who'll grab the microphone off you and won't let it go for the rest of the night". Mum: "You know some Swedish - what's he singing about?" Laura: "Think it's about picking himself up again.. or something". "Mystery" - Dead By April. It's not been a classic year, but this year's final has certainly given us a diverse line-up. We've had the breakdancing bank clerk, the tortured actor and now the death metal boyband. There is potentially a decent song somewhere in there, but then it gets ruined with all that growling. Mum: I don't remember this. Laura: This was in the first week, when you weren't really watching it. Mum: Do the audience get these pink cowboy hats thrown in for free with their tickets? Laura: Don't know. Back to the song...it's too stop-start/disjointed for me. "Why Start A Fire" - Lisa Miskovsky. When we first heard this it failed to start a fire at EuropeCrazy HQ, yet between then and now I listened a few more times and it ended up becoming one of my favourite songs of this year and may even figure in my year-end chart. Its subtlety is its strength, and that made it particularly stand out during the final. Laura: This has probably grown on me more than many of the other songs in the final. Mum: I quite like this. Laura: Quality song, written by Norwegian songwriters including the lovely Alexander With (who looked particularly hot in the pre-song announcement). "Baby Doll" - Top Cats. 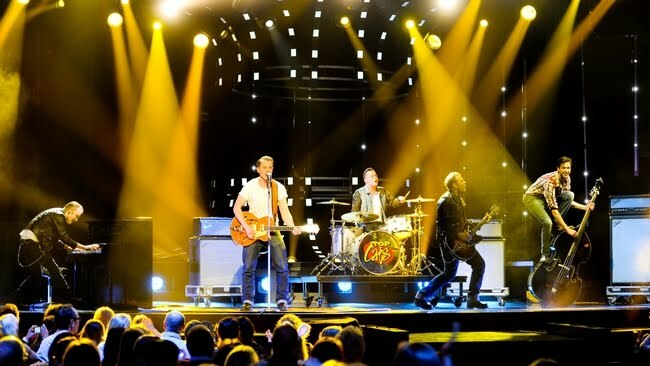 Fulfilling what's become an annual rockabilly-quota, Top Cats milk the moment and enjoy what will probably be the peak of their career. Mum: Oh yes, I remember them. I feel as if I've heard this song a million times. Laura: And as I say at this point every week, 'it's not as good as The King, by the Playtones last year'. 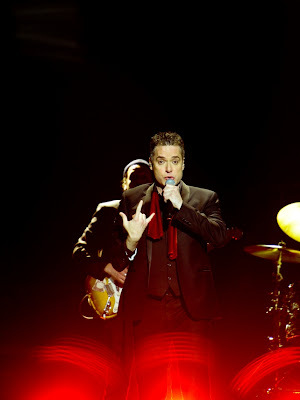 Mum: the singer reminds me of the bank clerk guy from earlier on. Laura: this should get the Dansbandskampen-vote. The novelty's worn off by now. You can't even hear Sarah announcing this one because it's drowned out by the audience's cheers. 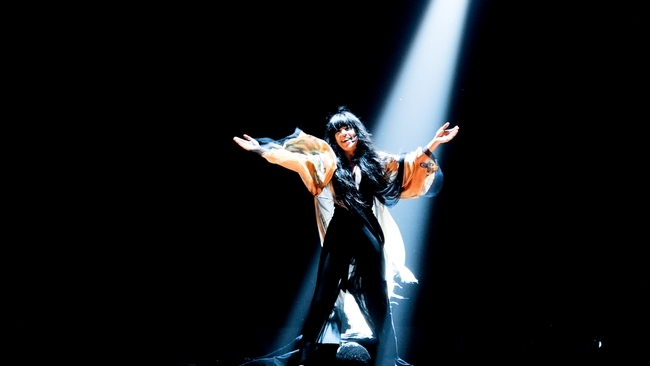 The dark and mystical staging and choreography - and Loreen herself - is crucial to the song's success. Without that, I doubt if it would have been so successful. Mum: this is too repetitive. Euphoria, euphoria, euphoria. Laura: it's all about her performance which lifts this song out of the ordinary, as I said before. It's got that 90s dance vibe to it, which I love, but I only like this song rather than love it. She is better than the song though. Ulrik walks onstage to "Bittersweet Symphony" by The Verve, which automatically earns him extra poäng at EuropeCrazy HQ. Everyone is waving lights in the stadium, and I'm very impressed. Globen looks majestic. Laura: I think this is one of the most underrated songs this year. Mum: not often that you see two drummers! By this stage we both agree that our favourite of the evening so far is....Lisa. "Mirakel" - Bjorn Ranelid and Sara Li. The now-bearded Mr Ranelid threatened to quit the contest because of all the abuse from internet trolls, but he changed his mind and decided to stay. The tanned one and his dancey sidekick take the stage to "Conquest of Paradise" setting the scene for another epic performance....however I get the feeling that whereas the buzz for Flinck has grown over the past week, the momentum for this one has been lost. Laura: Herrrrrrrrrrrrrrrrrrrrrrrrrrrrrrrrrrrrrrrrrregud. Kärleken, kärleken, kärleken, oj oj oj oj! "Why Am I Crying" - Molly Sandén. The only "big ballad" this year. However I'd rather have had Sonja Aldén's subtle non-qualifier than this big shouty-screamy number. 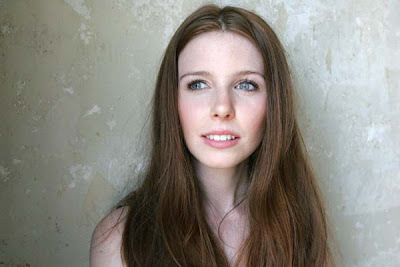 Molly is a very good singer though, but I'd like to see her back at MF in the coming years with an Agnes-style dance-pop stomper. Laura: Time for potato wedges! And finally..."Amazing" - Danny Saucedo. The man in the glow in the dark suit takes the stage to E.M.D. bandmate Mattias Andréasson's "Forlåt Mig" which I find quite amusing. He's managed to recover well from the sickness of the past week. I'm not so sure how much is live and how much is Memorex, but we're both much more impressed than we were a couple of weeks ago. Mum: good gimmick, these lighted suits. Laura: he's got the vocals right. Although the song itself is still a bit of a letdown, he's definitely my favourite tonight. Mum: mine too. Best tonight. So you're probably shocked that "Euphoria" finished so low in our voting. 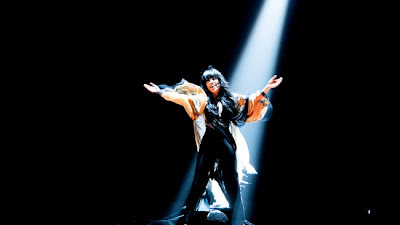 Loreen is such a strong artist, a one-off, with a fantastic voice and an incredible stage presence - but I just can't explain why I don't like the song as much as I probably should, and I wonder if it would have been so popular if another artist had sung it? Songs over, and time for the best moment of the final - a sketch which will go down in Melodifestivalen legend. 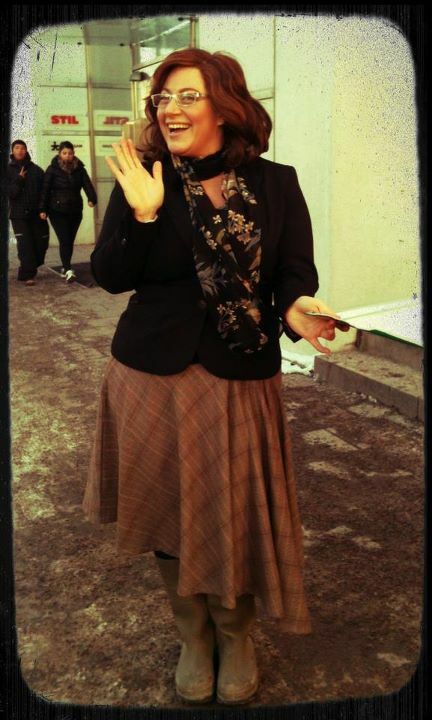 Sarah Dawn Finer as the clueless EBU lady Lynda Woodruff, complete with impeccable English accent - a classic comedy creation! On to the international jury votes, where Loreen gets most of the top marks, Danny gets a few 12s too, the UK jury spokesman Simon Proctor's as good at pronouncing Azerbaijan as Lynda Woodruff is (! ), Malta buck the trend as usual and give their 12 to David, oh and hello Tooji in Norway!! After the international jury votes, the tan man and the barefoot guy are propping up the scoreboard. 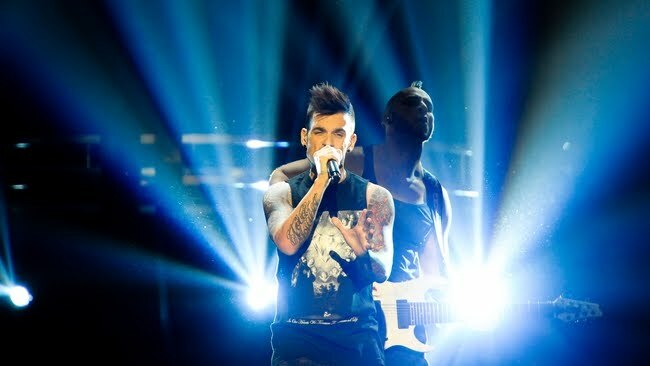 "Euphoria" is a runaway winner even before the televote is added. The song's success with the international juries is a very good sign. I have mixed feelings about the song as even though it's wasn't my favourite in Melodifestivalen, it's a great choice to represent Sweden and I can see it achieving a very high position in ESC. And having heard some of the rubbish from other countries masquerading as entries this year, I'd have to say that "Euphoria" is one of the best. And so to the interval act. 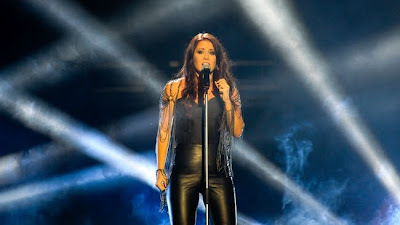 The tradition of the previous year's winning song being re-interpreted in a different way is now a regular feature of the final, and it was certainly a major coup to get a previous ESC winner to sing it. I refer to Helena Paparizou, reinterpreting "Popular" in "Chicago" style. It was OK, she looked amazing, but it strangely left me cold like most of this year's "Tredje Chansen" efforts. Now time for the televote. By this point the camera focused on Danny, whose disappointed expression clearly showed that he was resigned to losing. In any other year he would have triumphed, but this year he was up against something very special indeed. As for the televote results, the most "Amazing" thing about the televote was that third place for Thorsten Flinck, and fourth place for Top Cats! Oh well, each to their own. So Loreen carries the hopes of Sweden to Baku with "Euphoria". 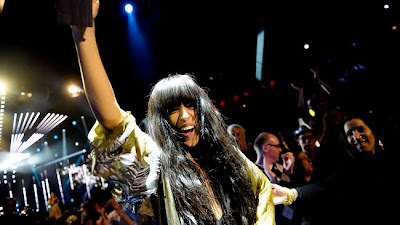 Big congratulations to Loreen! However well Loreen does in Baku, she's already a record breaker, receiving the highest televote figure ever in Melodifestivalen - 670551 to be precise. Since it was selected, "Euphoria" is picking up a lot of international buzz and is probably the strongest favourite for a Swedish win in many years. Stockholm 2013, anyone? ...just to let you know that I've had a very busy and tiring week and literally haven't had a minute to blog. Hoping to resolve the situation over the next few days when I'll eventually post my Melodifestivalen final review and some other stuff too. EuropeCrazy is 5 years old today!! 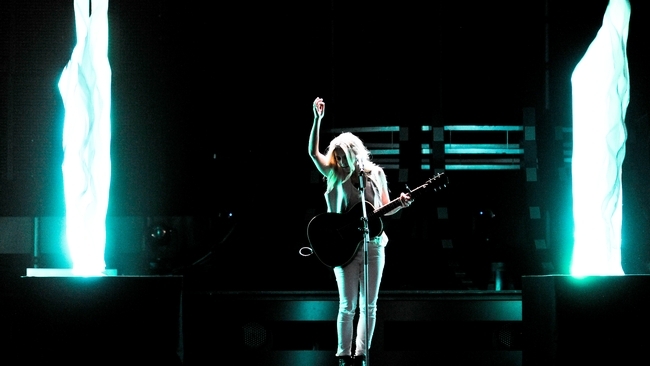 Sunday 11th March, the day after the Melodifestivalen final, and a new blogger takes her first steps into blogland. Fast forward five years on, to Sunday 11th March, the day after the Melodifestivalen final, and I’m celebrating five years of blogging! ...and that's what it's all about. If you've ever passed this way and read a post or left a comment, then I just want to thank you for all your support - it means so much...and as for all my blogging pals, well what can I say? It's such a pleasure to have got to know you all, and here's to many happy times ahead! "I'm feeling great, I'm feeling awesome". Well that's not the case if you're either Danny Saucedo or Loreen, as this year's Melodifestivalen front-runners have both been struck down with throat/voice problems. But don't worry, because even if the vocal fortunes are against them, the gods of Memorex will make it all ok :) Only joking of course and I hope both of them recover in time to give their best vocal performances 24 hours from now. Yes, it's exactly one day left till the Melodifestivalen final and it appears that the people of Sweden have spoken. If the popularity polls and the download charts are anything to go by, it's a foregone conclusion that "Euphoria" performed by Loreen will win Melodifestivalen on Saturday night. But Sweden will only have it's say in 50% of the voting with the other 50% being decided by a group of international juries, initially introduced to provide a barometer of international taste with a view to how well a winner will do at Eurovision. They got it pretty accurate last year with "Popular" so here's hoping that whatever song they choose, it will get at least a top 5 result again, in Baku. What do I think? Well, on the whole I've been disappointed by the quality of the songs this year in comparison to, say, the last 4 years - every year there's been at least 5 or 6 songs which I'd continue to listen to after the contest was over, but I can't say the same for 2012. The question I asked after hearing all this year's songs was...where's the Melodi gone? Where are the enduring songs? "Amazing" is very modern and contemporary, as is "Euphoria", but neither of them could be described as a classic, memorable song. Although having said that, "Euphoria" is better than "Amazing". In any other year Danny would have been a very obvious winner, but two things are stopping him this year: "Amazing" just isn't a good enough song, and he's met his match against such a commanding, compelling performer as Loreen. Whatever happens tomorrow night, I hope Sweden (and the international juries) make the right choice - and I don't mean Thorsten Flinck!! 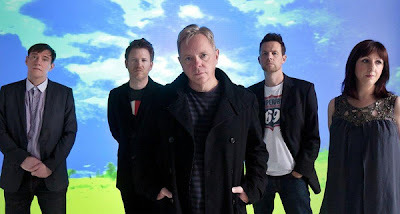 Back in 2007 I wrote a post here about the continuing acrimony which was destroying my all-time favourite band, New Order. At that time I thought it would have been the best idea to just end the band once and for all. Over recent months, however, it was announced that New Order would be reforming, including the return of Gillian Gilbert, but without Peter Hook in the line-up. Needless to say Hooky wasn't too happy at that time, for example he told Rolling Stone that he was "saddened and upset" by the reunion news. Peter Hook has now alleged in this NME article that replacement bassist Tom Chapman is "miming his bass parts" from a backing tape. Hooky, always one for a quotable quip, described it as "the Milli Vanilli of bass"! Meanwhile New Order denied that Hooky's bass parts are used in the "Round and Round" backing track and in their statement they went on to retort "...People living in glass houses shouldn't throw stones or their recent fake DJing YouTube hit might need to be recalled. Keep watching." This may all be amusingly bitchy, but I also find it more than sad that the legacy of Joy Division and New Order has disintegrated into such an embarrassing slanging match. Please release me, let me go....to Baku! It was announced on Thursday night that Engelbert Humperdinck will represent the United Kingdom at this year's Eurovision Song Contest in Baku. Not Charlotte Church, Katherine Jenkins, John Barrowman, Pixie Lott, Katie Melua, Steps, Right Said Fred, Atomic Kitten....all of whom were rumoured at one point or another to be doing it this year. No, the BBC surprised us all by going for the legendary singer who at 75 years old, he will be the oldest singer to appear on the Eurovision stage. So he's already made history without even singing a note. As publicity coups go, this one's already been a cracker and there's certainly been a lot of reaction following the announcement. It's certainly an unusual choice, but it's an inspired one. 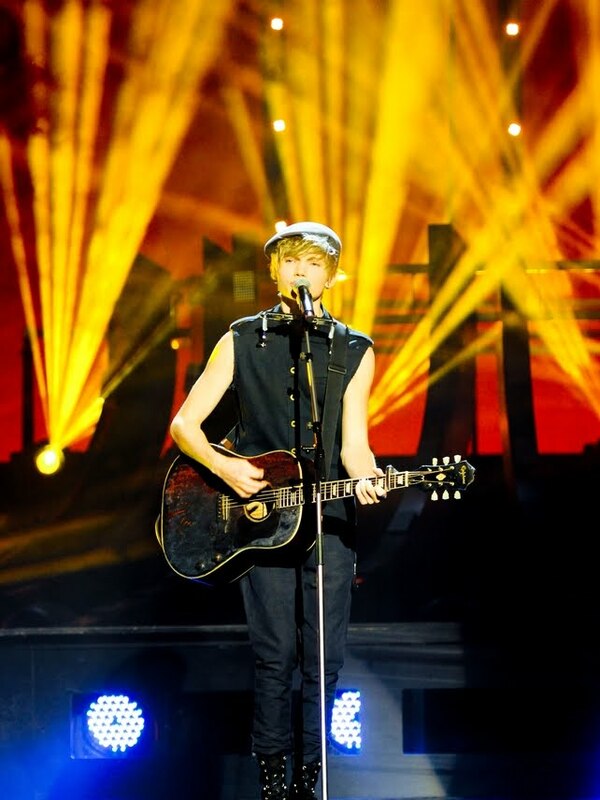 Apart from the novelty value, he's got a great voice and with the right song he will certainly get the viewers of Europe to sit up and take notice. Ah yes, the song - I'm guessing it will be a contemporary big ballad, maybe something in the style of Adele's "Someone Like You" which continues to take Europe by storm. The UK has done better in recent years with ballads - think "Come Back" and "It's My Time" - so this would be a good choice I think. The songwriters are Martin Terefe and Sacha Skarbek, and we should get to hear the song in the coming weeks. I read somewhere that Engelbert continues to play 200 concerts a year, so one more night in Baku should be a doddle. We wish him all the best and in the words of the wonderful Melodimen, we will be #humperdincking on the 26th of May!